Smita Singh was appointed to the Franconia Conference Board by delegate affirmation at the Fall 2016 Assembly, beginning her first term with the Board in January, 2017. Smita is a member at Whitehall Mennonite Church in the Lehigh Valley since 2000, when she immigrated to the United Stated with her husband Naveen and son Ronak. Growing up in Nagpur, India, Smita was raised in a Christian home with church and faith as an integral part of her upbringing. She was actively involved with her church youth group, Youth for Christ (YFC), Evangelical Students Union (EU), children’s ministry, National Council of Church’s in India (NCCI) and Maharashtra Village Ministries (MVM). She has led women’s groups and youth groups through BSF International (Bible Study Fellowship), and as a member of Whitehall, Smita has worked in children’s ministry, helped with fundraisers and served on the budget committee and worship planning committee. She graduated from Nagpur University with a Bachelors in Computer Science. She then received her Master’s Degrees in Business Administration specializing in finance and marketing. Smita has experience as a Google Quality Rating Consultant and also owns an Etsy business, “Rosmina Collections.” Recently, she began working in the Customer Service Department at Nestle. 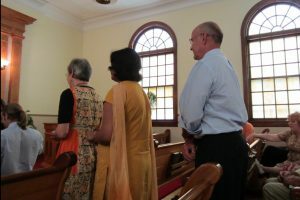 Janet Byler, Smita Singh, and Ron Bender finished out a long line of blessings and anointing for Pastor Rose Bender at her ordination in 2012. 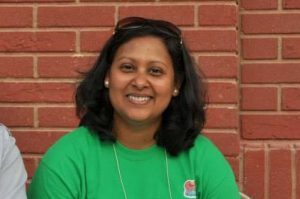 Initially, Smita was not interested in being on the Board at Franconia Conference, but after prayer, both she and Naveen sensed that this was a call to move out of her comfort zone, especially after having an encouraging conversation with Steve Kriss, then the Director of Leadership Development. Now, she is looking forward to discovering how she can use her gifts and experience to serve in this role and hopes to fulfill God’s calling. Her favorite passage of Scripture is Isaiah 41:10, “Do not fear, for I am with you; Do not anxiously look about you, for I am your God. I will strengthen you, surely I will help you, surely I will uphold you with My righteous right hand.” She says she connects to God best by having her quiet time praying and seeking His word for discernment. 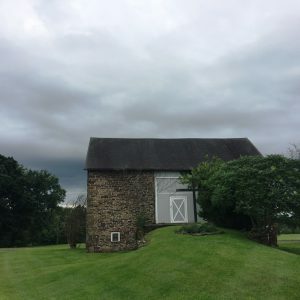 Smita describes Whitehall Mennonite as an eclectic group of people filled with hospitality, diverse in speech and culture, with a common goal to serve the Lord and care for each other. Something she has learned at Whitehall is that God is faithful and always provides in unexpected ways. Transformation happens one person at a time and many times the transformation takes place years after the seed was planted. Smita lives in Breinigsville, PA with her husband, and now 14-year-old son. In her free time, she enjoys making cards, helping her son with his school projects, volunteering at church, and as a volunteer coach for Springhouse Middle School Science Olympiad Team.